I ran the Tokyo Marathon last Sunday under miserable weather conditions. It was raining before the race started with temperatures of around 5-6 degrees. The relentless rain and the biting wind made it difficult for me to run at my goal pace, furthermore my poncho buttons kept getting undone and buttoning it up required a level of concentration, distracting my focus on my running pace. The cold also caused my hands go to numb - by km 38, the 'pins and needles' in my hands were so severe that I had to shake them while soldiering on with my run. 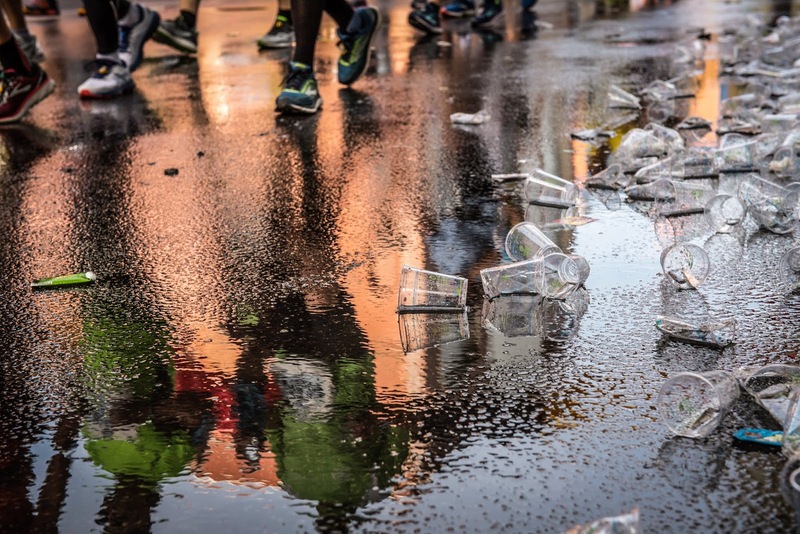 It was the coldest day in Tokyo Marathon history, according to the Race Director, Mr. Tadaaki Hayano. Some runners including top Japanese male runner Suguru Osaka withdrew from the race as their body succumbed to the cold and harsh conditions. 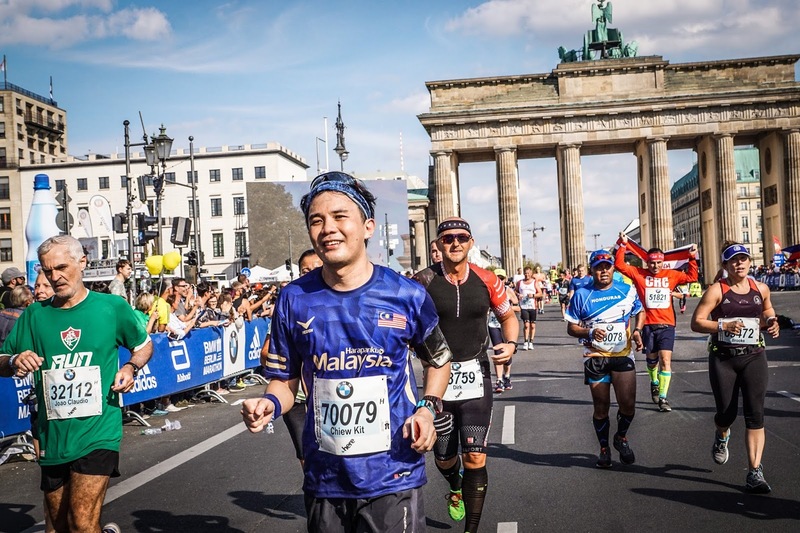 Malaysian tops runners Muhaizar Mohamad and Leo Tan also withdrew, which I'm sure was a tough decision for them to take. In spite of the unfavourable weather conditions, I managed to achieve my goal of finishing the race. Achieving a new PB of 4:42 (shaved off 28 minutes from previous PB) was indeed icing on the cake on this bone-chilling cold race day. 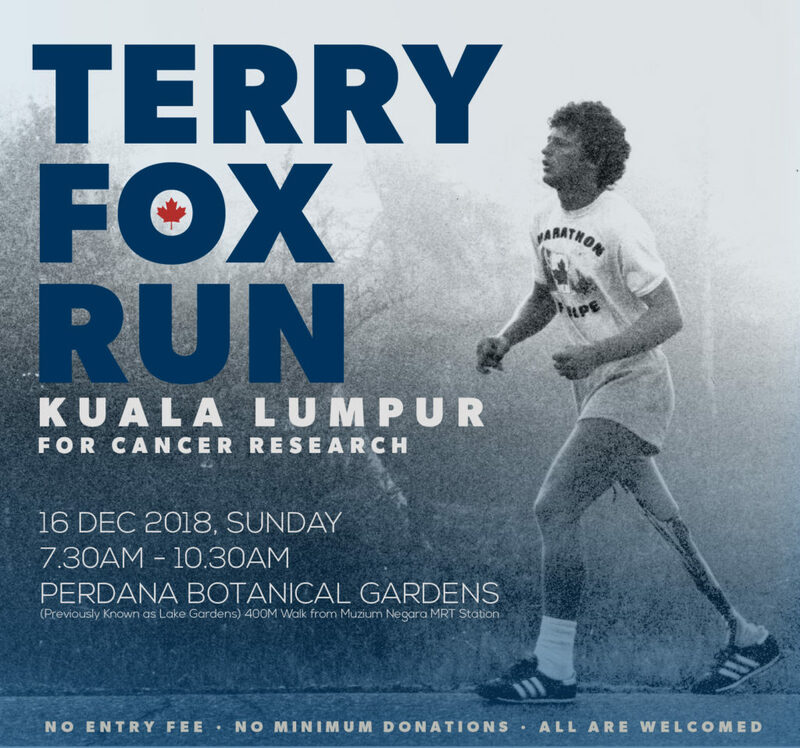 The Terry Fox Run has been taking place since 1991, and this year it was on 16 December at the Perdana Botanical Gardens. Click on here to learn about the Terry Fox story. The Marathon of Hope, which Terry embarked on in 1980 was an adventure with a goal of running across Canada. He ran close to a marathon a day, for 143 days, which was truly a feat not only for the able-bodied runner, and an extraordinary feat for an amputee. Read the story of Marathon of Hope here. 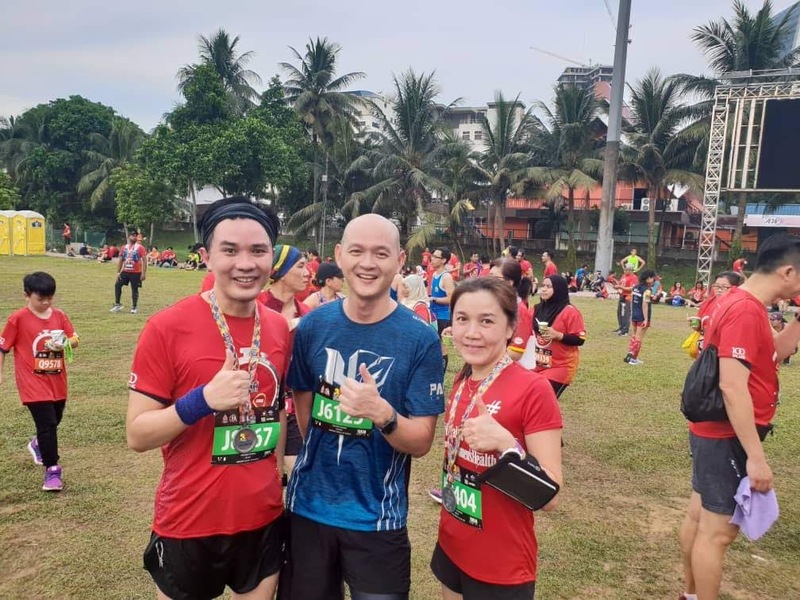 I'm glad to have participated in this charity run as my final event of running in 2018, in support of cancer research in Malaysia. 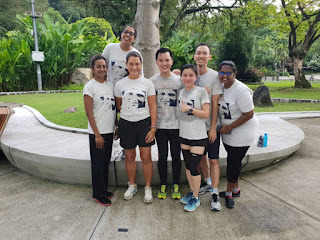 With the company of family and friends - running alongside one another - the run was truly an all-inclusive and enjoyable one. 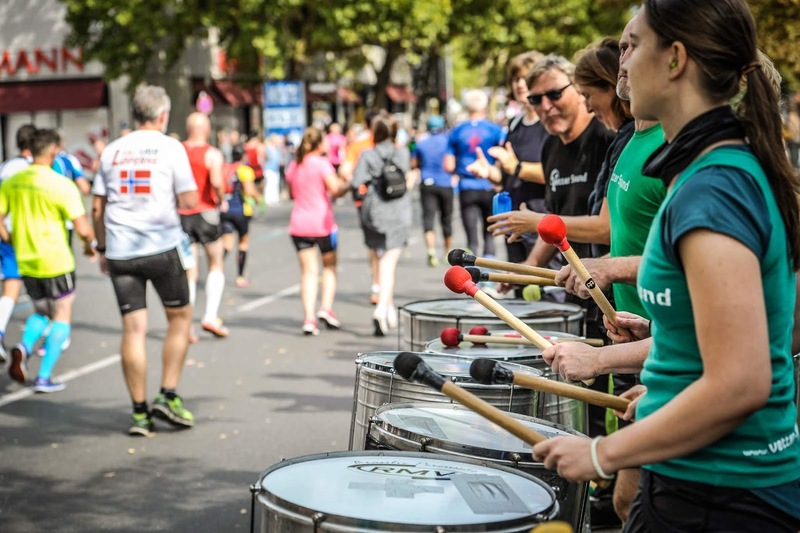 There's a great camaraderie among runners in a non-competitive run as participants are more concerned about the person they are running with than their running pace. 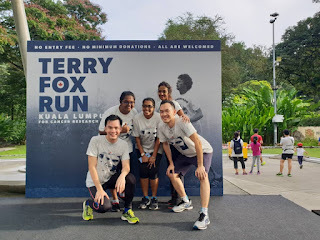 Personally, participating in the Terry Fox Run KL which was 100% organised and run by volunteers was an experience which really count towards running for a cause. "It's got to keep going without me" Terry Fox. And so, 37 years on, Terry Fox run is staged around the world in his memory and to continue his dream of finding a cure for cancer. cer patients many of them who are young children, that he decided to run across Canada to raise money for Cancer Research. He called his journey the Marathon of Hope. of them who are young children, that he decided to run across Canada to raise money for Cancer Research. He called his journey the Marathon of Hope. 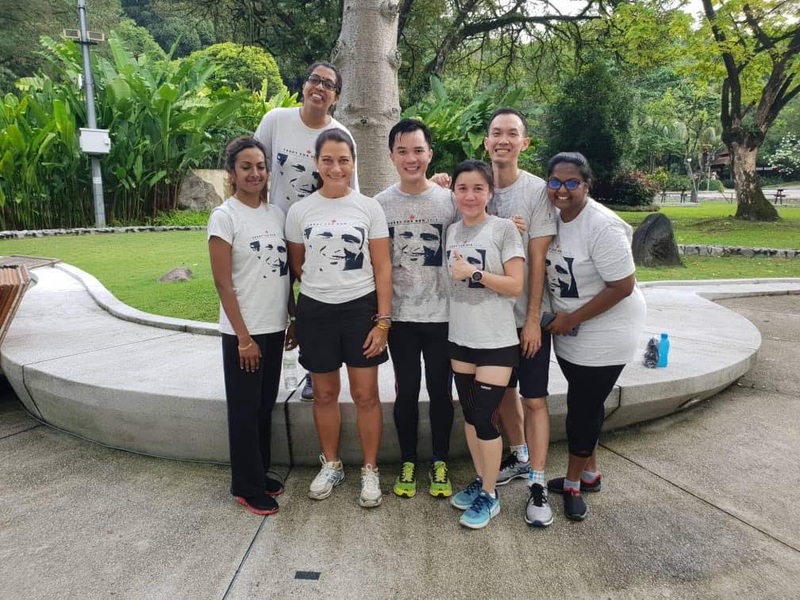 Terry ran for 143 days, ovhe Terry Fox Run Kuala Lumpur has been taking place in Malaysia since 1991, this event is held in memory of the late Terry Fox to keep his dream of a Cancer-Free world alive. Terry Fox was 18 years old in 1977 when he was diagnosed with bone cancer which led to his right leg being amputated above the knee. He was so overcome by the suffering of other cancer patients many of them who are young children, that he decided to run across Canada to raise money for Cancer Research. He called his journey the Marathon of Hope. Terry ran for 143 days, over 42KM everyday across Canada. He was forced to stop running because Cancer had appeared in his lungs. Terry passed away at the age of 22. The Heroic Canadian was gone, but his legacy and dream lives on with everyone of us who share the same dream. The Marathon of Hope lives on with us. er 42KM everyday across Canada. He was forced to stop running because Cancer had appeared in his lungs. Terry passed away at the age of 22. The Heroic Canadian was gone, but his legacy and dream lives on with everyone of us who share the same dream. The Marathon of Hope lives on with us. osed with bone cancer which led to his right leg being amputated above the knee. He was so overcome by the suffering of other cancer patients many of them who are young children, that he decided to run across Canada to raise money for Cancer Research. He called his journey the Marathon of Hope. he Terry Fox Run Kuala Lumpur has been taking place in Malaysia since 1991, this event is held in memory of the late Terry Fox to keep his dream of a Cancer-Free world alive. Terry Fox was 18 years old in 1977 when he was diagnosed with bone cancer which led to his right leg being amputated above the knee. He was so overcome by the suffering of other cancer patients many of them who are young children, that he decided to run across Canada to raise money for Cancer Research. He called his journey the Marathon of Hope. Terry ran for 143 days, over 42KM everyday across Canada. He was forced to stop running because Cancer had appeared in his lungs. Terry passed away at the age of 22. The Heroic Canadian was gone, but his legacy and dream lives on with everyone of us who share the same dream. The Marathon of Hope lives on with us. Terry ran for 143 days, over 42KM everyday across Canada. He was forced to stop running because Cancer had appeared in his lungs. Terry passed away at the age of 22. The Heroic Canadian was gone, but his legacy and dream lives on with everyone of us who share the same dream. The Marathon of Hope lives on with us. 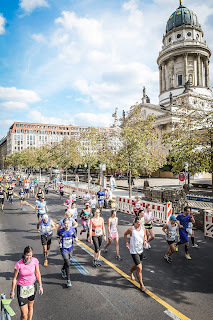 Early in the year, I received an email from SCC, the organizer of Berlin Marathon that my application through ballot entry was successful. So my FM plan for the year was set: I would be running the Berlin Marathon 2018, the fastest marathon (many world marathon record times were achieved in Berlin) on September 16. 16 September is also Malaysia Day. a public holiday to commemorate the formation of the Malaysian Federation in 1963. 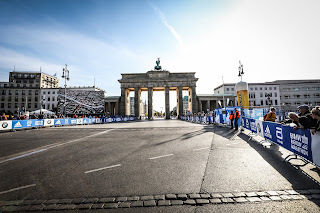 What better way to celebrate this day than to run my first World Marathon Majors in the beautiful German capital city. For the monumental event of my running journey, I ordered a customised running shirt which I I would be wearing on race day. 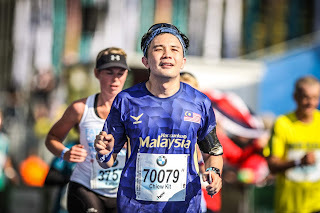 It arrived a week before the race and served as an impetus to continue with training till the day I flew out of Malaysia. I chose "3" as this would be my third FM (there previous two I ran in the SCKLM 2016 and 2017 respectively). On the front of the shirt, the words "Harapanku Malaysia" or my hope for Malaysia gives me an opportunity to express my hope for a greater, better and more inclusive Malaysia. I purchased an 18-week three-times-a-week training plan in June. I set a goal of sub-5 hour for this marathon. However, as the weeks by and with my continued shortfalls in training, I figured I revise my goal that I would run my best FM, i.e. 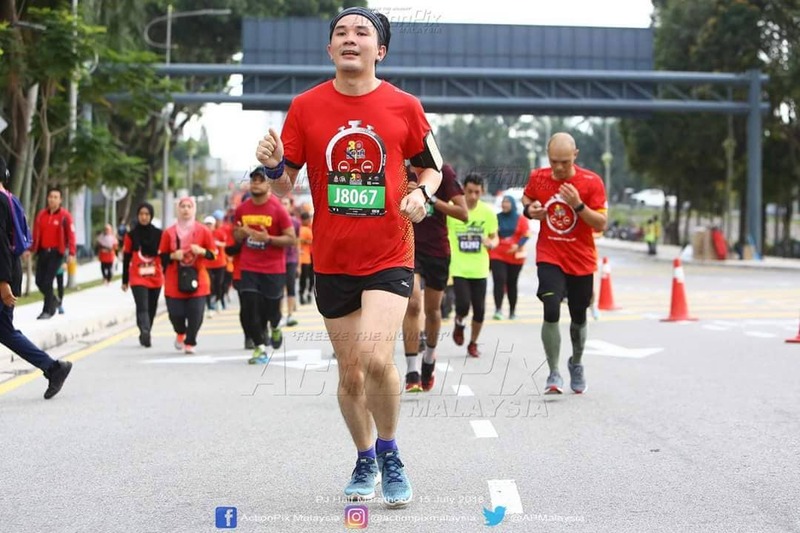 improve PB of 5:38 set in SCKLM 2017. I was able to get in 3 days of running a week for most weeks, but the long runs were always a challenge for me due to work/life/heat/rain. 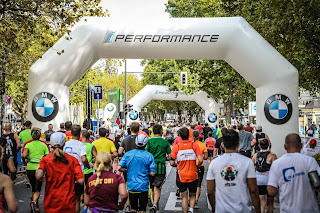 I know that the most important component of training are the long runs and since I missed them or cut them short due (the longest I was able log on was 28km), I would pay dearly for those 'debts' on race day. 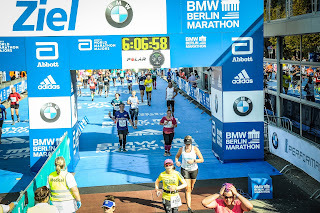 To make matters worse, around three weeks before race day, the plantar fasciitis (PF) in my right foot flared up rather badly; fortunately a couple of visits to a physiotherapist helped me to keep the pain under control. On my 17th week of training, I joined Leo Tan for an evening run at the National Sports Centre in Bukit Jalil. The meeting with him certainly gave me a much-needed boost for the upcoming race. September, I proceeded to check-in at my hotel in Wilmersdorfer Str. 36. Lucky for me, the hotel staff were happy for me to do an early check-in. After that it's straight to the Berlin Vital Expo to collect my race pack. Located at the former airport Tempelhof just over a kilometer from the hotel, getting there was easy with the U-bahn. From the Tempolhof station, there was no need to refer to the map in the race guide as I just followed the other participants who were making their way to the expo. The drizzle in the afternoon did not dampen the spirit of the enthusiastic crowd. From the reports that I read about the big crowds at the expo every year, I determined to go on Thursday afternoon to avoid the massive crowds on Friday and Saturday. Although a little tired from the long flight, the excitement of checking out one of the biggest expos in the running world of sports quickly took over me. At the entrance to the expo, I produced the required Start Card and upon verifying my ID, the steward put on a wristband on my right hand. The band can not be removed as it is stapled around your wrist (to avoid unauthorized transfer of bib). The wristband serves as a pass to enter the race kit collection area which is restricted to runners only. The walk to the bib collection area was a long one, and I passed a long line of exhibitors marketing and selling everything from nutrition, functional wear, running gear, sports medicine to active holiday package. There were over 190 exhibitors and numerous photo spots - I was overwhelmed by it all. My race bib was printed on the spot on presentation of my ID and the wristband, and I was also given a timer chip (ChampionChip) which was to be tied to the shoe lace. After that, I was handed my race pack which contained a sponge, a deodorant, a shower gel and a fast-acting energy bar. I thought it was strange that the organizer gave me a sponge to carry with me on race day. After much deliberation, I decided to leave it behind on race day. Next I queued for the pre-ordered finisher t-shirt. There was a long single file, but the wait was only around 15 minutes as the stewards controlled the crowd in an organized and orderly manner. The steward took a look at my bib, detached the voucher on it and handed me my Adidas tee. Next, I went and queued for a commemorative poster which took another 15 minutes or so. More queuing was required as I wanted to pose at a couple of photo spots. I got up early the next day. I kept it simple for breakfast - bread and jam, cereals with milk and banana with a cup of coffee to boot. I took the U-bahn (U2) and got off at the Potsdamer Platz. From the station, it was an 8-minute walk to the start at Strasse des 17.Juni. 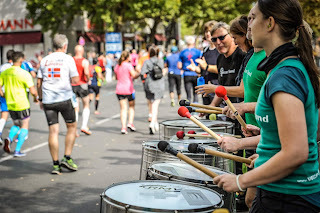 Along the way, I saw runners of different nationalities, colours, shape and form. 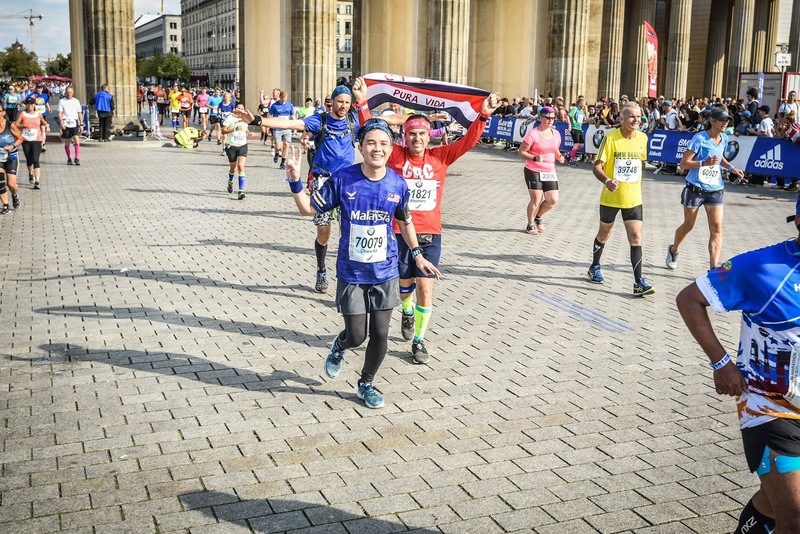 I showed my wristband and upon entering the participants area, quickly settled into my block (H, the eighth and last block) around 8:30 am, just in time to join the organised group warm-up. There was a lot of waiting till flag-off at 10:05 am (3rd wave), but the emcee kept the crowd engaged with various dance moves. There were cheers everywhere when the gun went off for the elite runners at 9:15 am. My goal for the race was to hold myself back and to run at a slow pace of 6:40 per minute. I didn't want to think about the lack of training or the PF pain in my right foot. Focus on running form and breathing. The first 10km went by without any struggle. I had a steady pace of 6:20-6:30/km. 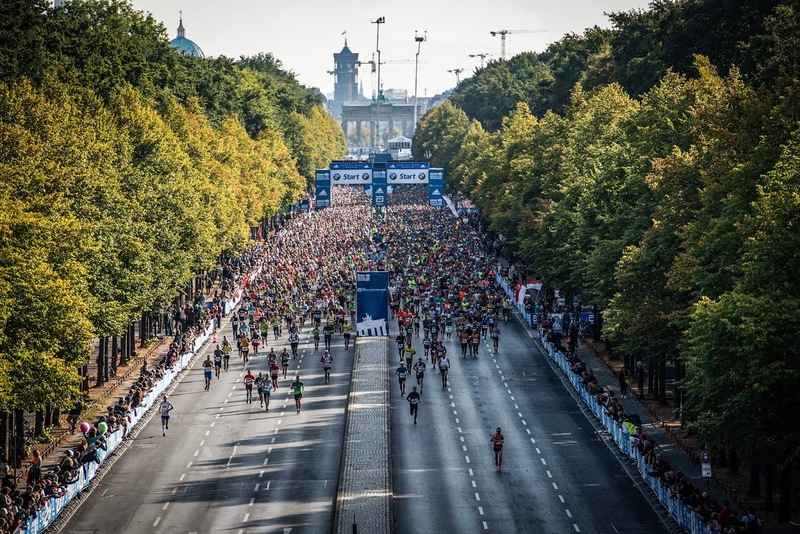 One could understand why the Berlin Marathon is touted as the fastest Marathon in the world - the course is mostly flat the roads are wide. There was no problem for me navigating on the course despite the high number of runners around me. The first landmark which I immediately recognised was the victory column (Siegessäule). This was soon followed by the Reichstag, which I had the privilege of visiting a day before. The next 10km went by without any problems. A Malaysian runner, a lad in his twenties came from behind and put his hand around my shoulder and greeted me, "Hi, I'm Hafiz and I'm from Malaysia". We exchanged some pleasantries and he took off. I reminded myself to keep a steady pace of around 6:15-6:20/km. Another Malaysian came up later and said hi to me. Her name is Ina. 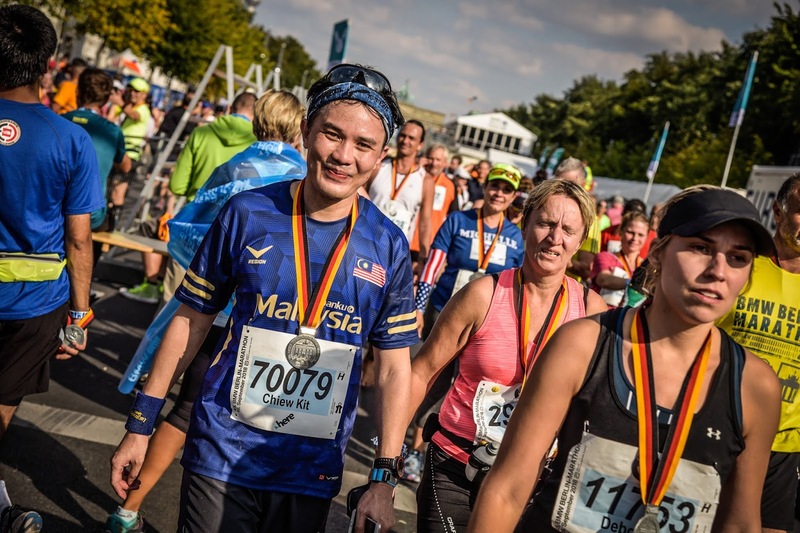 She's a sub-5 finisher in SCKLM, a mother and fast runner! She paced me for about 5km up to 20km. I guess we were both quite comfortable as we were able to converse in short sentences without worrying about losing our breath. After the refreshment station at 20km, I lost track of her. Half marathon at 2:15. Looking good, CK. Keep it up! The crowds that came out on the day to support the runners were awesome. They carried placards bearing the name of the runner whom they were cheering for. Some placards had words like "touch here (button) to power up". There were also cheerleader teams, live bands and percussion artists.. The atmosphere was carnival like! I waved and thanked the performers when I ran past them. An interesting observation was that there were thousands of crushed plastic cups in the water/refreshment area. Runners had no choice but to step on the used cups. The were hundreds if not thousands of runners around me doing the same thing, thus creating a cacophony of crushing sounds that at beast I would describe as unpleasant. The hydration stations were all well-manned and the volunteers were aplenty to hand a drink to a grateful runner. 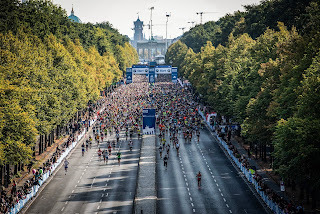 Around 25km, someone held a sign which stated a new WR of 2:01:39 had been created. Congratulations to Eliud Kipchoge. I'm glad to run in the same race in which he achieved a new world record. At 28km, things started to go downhill for me as I started to feel pain in the thigh in both legs. I tried to concentrate on my running form, but the pain persisted and soon I felt tightness in my calves. But I had to stop, and went to the side of the road and did stretching for the legs. It helped only a little. After a few steps, the pain came back. It was agonising. The quads were hard and the calves were on the verge of going into spasm. But it's not the first time that I experienced this problem. At 30km, I knew I had to come up with another strategy. 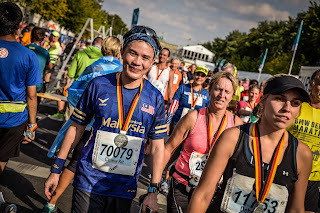 I figured it's not possible to walk to the finish line as there were 12 km to go: I had to run with small strides and made sure that I avoided heel landing altogether to keep things light on my legs. This strategy worked somehow as I managed to do a little running until my quads hardened and then I switched to walking. Many runners passed me by, and one came from behind me, a Asian lady I'm guessing from Singapore. She touched my shoulder and said "only a few km's to the finish line". I nodded to her. It's an understanding between runners that goes beyond words. I received another boost when an Asian lady in the spectator area shouted my name (she's the only one who addressed me by name, while other spectators referred me as Malaysia). She said "Chiew Kit, you can do it!" Yes, I've got this. I've come this far. And no I'm not done yet. I mustered whatever energy that was left in me and charged on. Thank you spectators and fellow runners - you guys are awesome! 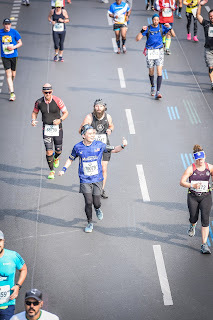 At around 40km, at which point I was almost completely spent, a volunteer said we were at the last turning to the finish line and those words, those words, were music and magic to my ears. After I received the finisher medal, I hobbled to the beer (non-alcoholic) station to get a free beer. It was the longest 500m walk I had to endure but it was worth it. I found a spot in the garden, laid out a plastic sheet, removed my shoes and lay down. 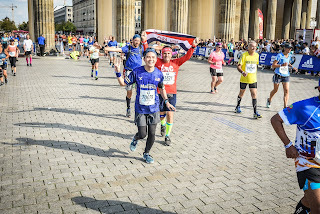 While the pain had not subsided, I felt incredibly satisfied that I had finished the Berlin Marathon, and achieved a new PB. 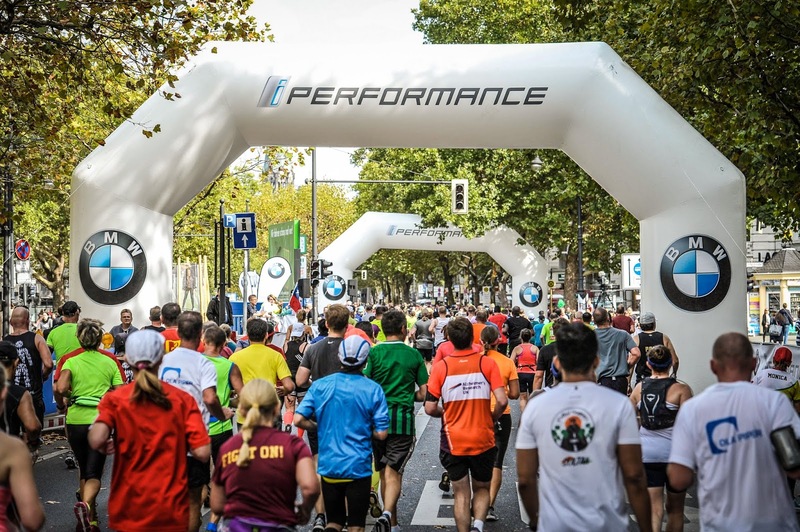 With the tag line "Run Because You Can", the 30th edition of PJ Half Marathon last Sunday was a success. In conjunction with the anniversary, this year a special category of 30km was offered in addition to the usual 21km and 10km. Furthermore, there was a 3km non-competitive category to make the PJ Half Marathon a family-friendly running event. A total of 11,000 participants thronged Padang Timur, some arriving as early as 4a.m. for the 30km distance with starting time at 4:45a.m. 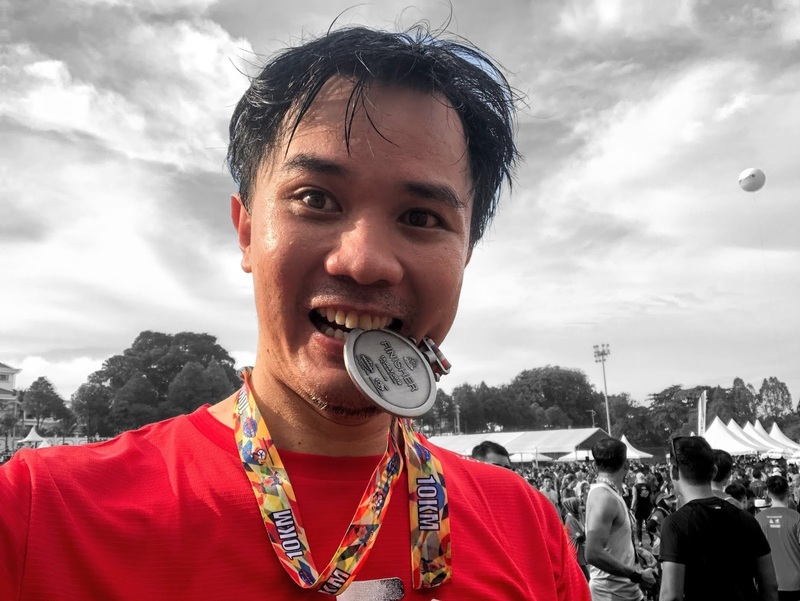 I ran in the 10k to assess my current fitness level as I have been training for my next marathon in September (I shall reveal which marathon it is later). I felt good throughout the race despite the pain from plantar fasciitis in the right foot. The inclines did not pose a big problem to me this time as I successfully maintained my level (by lowering my pace). I'm glad with the speed of my run. It's time to bring the speed and pace down, and seriously commit to aerobic training. There shall be no excuse to skip the long, slow runs at the next weekend. My name is Chiew Kit and I'm passionate about running. In January of 2014, I entered my first run in Singapore in a 10k race and was challenged by a friend to complete the run in one hour. I did it in 59:37 and realised that if I believed in myself I can do the job that I've set out to do. And that was the start of my running journey! Since then, I have been learning and sharing my running experience with other runners to stay motivated and on-track. Join me on my journey of running!